Pregnancy is a joyful time for a family. It is an experience that changes the woman who is going to be a mother and the rest of the family. But it’s a challenging time. Your body changes due to the hormones and so do your needs. If you are in your first, second or third trimester the pregnancy has a profound effect on your sleep. The quality, quantity and nature of sleep changes. Though these issues may start as soon as you conceive the hormonal changes triggered at every stage of pregnancy affect sleep architecture and patterns. Read our latest guide about the best pillows for backpain. Progesterone relaxes the involuntary or smooth muscles. This may cause heartburn, frequent urination and nasal congestion leading to sleep disruption. There is decreased wakefulness at night and reduced Rapid Eye Movement (REM) reducing vivid dream imagery. All this caused the expectant mother to fall asleep quickly. Oestrogen causes vasodilation thus the enlarged blood vessels may lead to oedema or swollen legs and feet. This may also lead to nasal congestion and disrupted breathing. Other hormones are also affected during pregnancy. Melatonin level increases during pregnancy. Prolactin causes slower wave sleep. High levels of oxytocin at night may cause contractions and disrupt sleep. This is the reason why most labors begin at night. Read our complete guide about the best bamboo pillows. Polysomnography studies have described the following changes in sleep. The general trend is that the time spent asleep or the sleep efficiency decreases as the pregnancy progresses, And the mother may experience more awakenings at night. The first trimester lasts the first 12 weeks. By the 10th week, the total sleep time increases with frequent naps during the day time. Then on, sleep becomes less efficient and there are frequent awakenings. The deep, slow wave sleep reduces and the gravida complains of the poor quality of sleep. The second trimester lasts between 13 to 28 weeks. By this time the gravida sleeps better. By the end of this trimester, she may experience frequent awakenings at night again. The third trimester lasts between the 29th week till term. During this time women may experience lighter sleep and more and frequent awakenings leading to reduced sleep efficiency. Besides the changes in the sleep patterns, the gravida may experience other sleep disorders such as restless leg syndrome, sleep apnoea, leg cramps, back pain, joint pain, carpal tunnel syndrome, etc. To reduce the above-mentioned discomforts, use pillows. You can use pillows to provide lumbar support alleviating back pain. Use pillows to raise your head against sleep apnoea and gastro-oesophageal reflux disease (GERD). Hold pillows between the legs to help with the restless leg syndrome. Pillows also help with preeclampsia. When you begin to feel these issues during pregnancy call the Obstetrician. They will suggest various solutions one of them being pregnancy pillows. These pillows are designed to support the changing contours of a gravidas body. They are designed to support the entire body thus are longer than the pillows we use daily. They support the body and lend comfort during pregnancy. As the weight increases during pregnancy, there is more pressure on the legs, hips and back. The pillow provides support to these areas relieving the pressure. Sleeping on the sides promotes blood circulation. This may become difficult for pregnant women due to the growing belly. The pillow cushions and supports the belly to promote better sleep. The gravida will enjoy long hours of sleep due to the maternity pillow. As it lets her snuggle for support at the places she needs. Pregnancy pillows are useful after delivery too. It lends support to hold the baby while feeding it. There are different sizes, shapes and styles of pregnancy pillows. In general, they support your side and roughly that the shape of a ‘U’ or a ‘V’ or a ‘C’. One of the ends goes under your head or arm and the other goes between the legs while your middle is supported by the length of the pillow. They are comforting, prevent you from tossing and turning. Besides supporting your abdomen while your baby grows inside you. Wedge-shaped Pregnancy Pillows are shaped as the name suggests. They are high on one side and narrow on the other. They can be round or triangular shaped. They can be wedged under the tummy relieving strain on the hips and back. You can use then behind your back if you are prone to tossing and turning. They can also be used like regular pillows to relieve reflux and heartburn. Some gravidas also use it to hold a hot water bottle or a heat pack against their side or back. 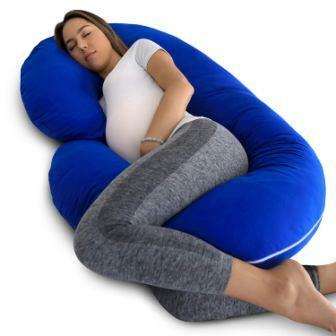 Full-Length Pregnancy Pillows support your full body. They can be straight or flexible. These can replace the multiple pillows used to support the body. The advantage is that it’s a single unit. It remains in place and is easy to maintain. The flexible pillow takes whatever shape you want it to take. It may be filled with microbeads, Styrofoam or foam. You can place your arms and legs around it and the centre of the pillow supports your midsection. Total Body Pregnancy Pillows wrap around your pregnant body for support and snuggle. They are 5 to 6 feet long and allow you to curl up inside. They not only hug your front but back. 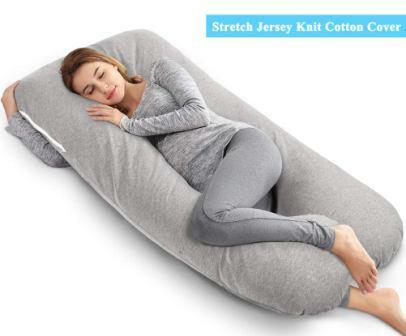 This means they let you sleep on the side, support your pregnant belly, wedge between your legs and support your back. They come in two shapes: C-shaped and U-shaped. The C-shaped pillow should be used in a riding position. The base of the C should be between your knees while you rest your head on the top of the C. Your back is nestled in the curve to relieve the pressure on your spine. U-shaped pillows should be straddled like a koala straddles a tree. One extension or leg of the U-shaped pillow should be in front of you supporting your belly. While the other should support the back. The head should rest on the curve of the U. They are the most supportive of all the pregnancy pillows. Besides, you don’t need a separate pillow while using these. Removable covers – You may sweat due to raging hormones. Due to this, your sheets may get soaked and so will your pillow. A removable cover helps maintain hygiene. Besides fresh linen soothes the nerves and promotes a feeling of well-being. The filling – Pillows may be filled with Styrofoam balls, polyester fibre, microbead fillings, memory foam or natural and organic fillings. Styrofoam fillings may be the same as the ones filled in the bean bags. Polyester fibre determines the firmness of the pillow. Microbead fillings are very light and feel like sand. Only they are much lighter. Memory foam takes the shape of your body and is firm. Shredded memory foam allows better ventilation. Natural fillings may be spelt, kapok cotton or wool. The filling also decides if you prefer soft versus firm pillows. Noisy pillows can disturb sleep. Some fillings can be noisier than the others as they rustle, crinkle etc. This may wake you up at night. Hypoallergenic pillows prevent asthmatic attacks, skin allergies, etc. Pay attention to the material of the pillow cover and the fillings. The size of the pillow should be according to your needs and size. Some gravidas prefer to swim in their pillows while others prefer small ones. Queen Rose is a California-based pregnancy pillow company. They sell all kinds of pregnancy pillows such as Long pillows, C-shaped, U-shaped or wedge pillows. They also make them in various sizes to fulfil your needs. Queen Rose Pregnancy Pillow is a U-shaped pillow. The pillow is filled with 100% polyester fibre filling in a cotton cover. The pillow cover is hypoallergenic cotton. The covers have zippers thus can be removed for washing. The design conforms to your body’s dimensions. The inner curve supports the mother’s belly and back by offering lumbar support. The upper and lower body can be elevated or adjusted to easy other conditions like congestion, etc. Queen Rose Pregnancy Pillow is ergonomically designed to ensure good sleep through the night. It lets the gravida stretch out comfortably and supports her body from the front and back. Besides the pillow can also be used for drug-free pain relief and nursing. 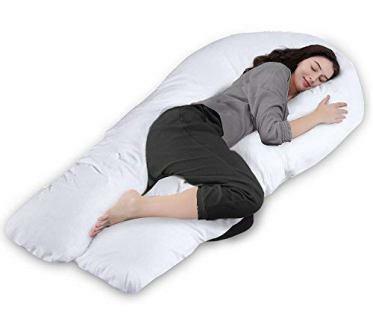 People with sciatica, fibromyalgia, congestion, sleep apnoea, gastric reflux, Myalgic Encephalomyelitis (ME), etc will find this pillow very useful. This pillow offers total body support for a painless sleep. Besides moms and people with various medical and orthopaedic conditions, normal and healthy people will find this pillow useful. As it can be used for lounging, reading, watching TV, etc. Besides after you are done even your pooch will love it. This Queen Rose Pregnancy Pillow is 55 inches long, 31 inches wide and 7.8 inches in circumference or thickness. It weighs 7.8 pounds. This Queen Rose Pregnancy Pillow comes with a 90 days refund guarantee and lifetime warranty. 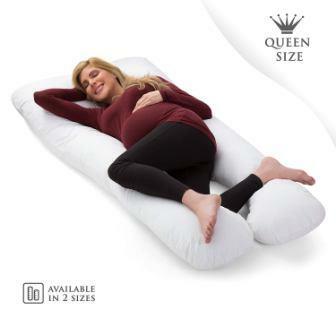 Queen Rose Pregnancy Pillow comes in two sizes 55 inches long and 60 inches long. So, you can choose the ones that fits your height. It is multipurpose. 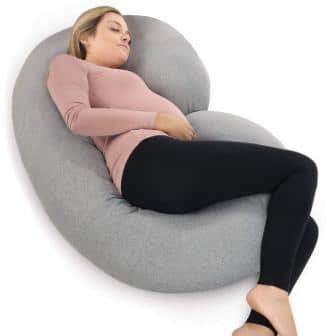 The pillow can not only be used by gravid women for support during pregnancy but also to feed their baby, snuggle up with their infant, read, sleep, etc. It is perfect for lonely people on cold nights to warm their beds. This pillow is also useful for people with various orthopaedic and medical conditions. Others in the family such as teenagers, pets and grownups will find this pillow useful to kick up their heels and rest. PharMeDoc strives to improve your health and besides the aspects of your life. Their health, fitness and bedding likes are customized by their experts to meet your needs. Their superior designs have been tested to perfection so that you can start living the way you want to today. The PharMeDoc Pregnancy Pillow is a C-shaped pillow with a 100 per cent jersey cover. This multipurpose pillow comes with polyfill that lets you adjust the material around your body. You can contort it as per your convenience while nursing, reading sleeping, watching TV, etc. The pillow is made of soft material with double stitched seams. The cover is machine washable and remains comfortable even after 300 plus washes. PharMeDoc Pregnancy Pillow comes with poly-filling in a cotton cover. The pillow is then covered with a jersey cover with zipper. The zipper lets you remove the cover for washes. While the double stitching and durable material will last you a lifetime. The C-shaped pillow eliminates the need for multiple pillows to support your head, neck, knees, hips, belly, etc. It is a multipurpose maternity pillow that will support your entire body through all your activities. The poly-filled pillow conforms to the contours of your body while you are reading, watching TV, nursing your baby or playing with your toddler. The cushioning and support from all the sides ensure better sleep, lesser night-time awakenings, pain relief, etc. This full body pillow is useful for anyone who needs support after surgery or suffering from orthopaedic issues. This pillow is also suitable for anyone looking to eliminate the use of multiple pillows. PharMeDoc Pregnancy Pillow 61.8 inches, 29.1 inches by 5.9 inches in length, width and height. It weighs 7.05 pounds. Cover made of 100% jersey material. PharMeDoc Pregnancy Pillow comes with a cover and lifetime warranty. ComfySure is an innovative brand that specializes in developing and selling ergonomic equipment that eases pain and lends comfort. The company was founded in 2015 with an array of ideas for this Internet store. They pay special attention to technology, style, quality and comfort. ComfySure Full Body Pillow is a plush due to the hollow fibre used to construct it. This U-shaped pillow conforms to the body, offering full body support that reduces pain and lulls you to sleep. The U-shaped pillow is designed to help gravidas sleep. The curve of the pillow lends support to the head and neck. The two sides support your body from the front and the back. The front support your burgeoning belly and wedges between your knees. While the back supports your hips, waist and back. The pillow is made of high-quality fibre the cover is removable and machine washable. ComfySure Full Body Pillow is a U-shaped pillow that is made of high-quality fibre that is hollow. This makes it light and well-ventilated. The fibre is stuffed in a cover. There is a removable outer cover with a zipper that is machine-washable. The pillow is plush and firm. It supports your back and hips while you sleep on your left side to improve blood circulation and ventilation of the lungs. The full body support helps relieve pain making it a restful night. Sleep not only rejuvenates you but also your foetus, promoting a sense of well-being. It helps elevate limbs during physical therapy for anyone recovering from injuries, surgery or medical procedures. The pillow can be used as a floor mat or a couch cushion. You can snuggle with a good book or watch TV. It is a maternity tool for breastfeeding. ComfySure Full Body Pillow is a 66 inches long, 33 inches wide pillow with a loft of 7 inches. ComfySure Full Body Pillow comes with a lifetime warranty. 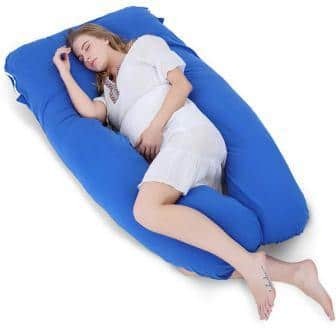 This pregnancy pillow is another offering from the Internet store ComfySure. They sell orthopaedic and home-improvement aids for your comfort. 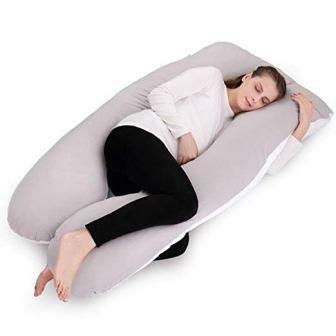 This is a full body U-shaped pillow for pregnancy, maternity and nursing purposes. This ComfySure Pregnancy Pillow is U-shaped to surround your body from all sides. The curve of the U is the headrest while the two legs support your body. It is made of 100 per cent polyester that is hypoallergenic. There is a cushion cover with zipper. This removable cover is machine-washable. It is ideal for people with medical conditions and allergies. This full body length pillow is ideal for a queen- and king-sized beds and can replace multiple pillows. 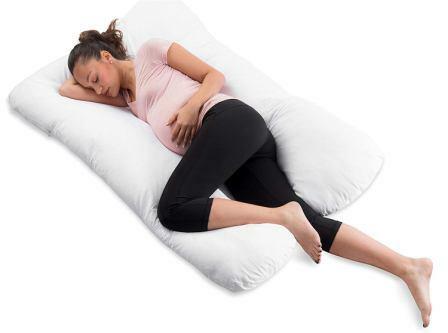 This ComfySure Pregnancy Pillow is pregnancy, maternity and nursing pillow. It keeps the entire body relaxed and helps support the back, arms, spine, hips, head and neck. It lets you lie on the side releasing pressure on the ribs. This not only lets you breathe easy but also promote blood circulation. It also makes it easy to turn over and accommodate different sleeping positions. The pillow helps you lounge with your baby to nurse it. It also provides extra support while resting. This pillow is recommended by doctors to alleviate conditions like congestions, acid reflux, sciatica, etc. The pillow is made of the most comfortable materials like the 100% hypoallergenic fabric and the fibre filling. This long pillow surrounds you from three directions lending support that lets you snuggle into a comfortable sleep. You don’t need extra pillows or require to reposition the pillow while watching TV or reading. It lends you lumbar support at all times. This ComfySure Pregnancy Pillow is 39 inches by 59 inches in length and width. The loft is 7 inches and it weighs 9 pounds. This ComfySure Pregnancy Pillow comes with a pillowcase and a lifelong warranty. Snoogle was designed by a registered nurse and mom. The natural contours of the pillow hug your body offering comfort and support. The pillow makes relaxing and sleeping cosy without the sweltering and sweating. The pillow lets you snoogle anyway you like as it can be customized to any comfortable position. The pillow comes with a removable cover with a zipper. The Leachco Snoogle is stuffed with poly fibre making it very light. It is stuffed in a cotton cover overlaid by a cotton cover with a zipper. It is removable and machine washable. The C-shaped pillow snuggled you from all sides. You can keep your head at the head of the C and straddle the pillow at the base of the C. The back or your belly is supported in the curve of the C and the belly can be rested in its mouth. This Leachco Snoogle replaces multiple pillows on your bed. This pillow supports you as described above and allows proper ventilation keeping me cool. The pillow lets you maintain a neutral position keeping your spine straight. It gently supports your head and neck while tucking snuggly between your knees. The pillow provides support to your hips, lower back and belly. You can also use the pillow for upper and lower body elevation. The pillow is especially useful for reducing swelling by lower body elevation. You could adjust it according to your comfort. It can also be used as a support for the pregnant belly. You can curve it into a doughnut shape for lower body cushioning. As we are protecting the mother and baby it is lead-free, latex-free, phthalate-free and BPA-free. Leachco Snoogle comes in various sizes and colours to fit your body size and decor. This C-shaped pillow is 60 inches by 24 inches by 7.2 inches in length, width and loft. The pillow weighs 3 pounds. Leachco Snoogle comes with a cover and lifetime warranty. PharMeDoc is there for you all through your pregnancy or recovery. These pillows support for your head, belly, legs and back. PharMeDoc is a fitness and bedding line that ensures that you are well rested to execute every day rejuvenated to full energy. So that you live your life with a sense of wellbeing and satisfaction. 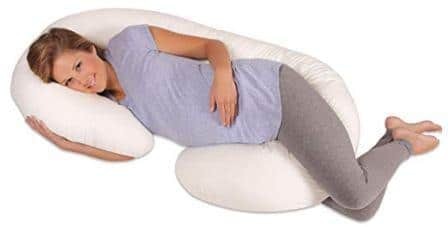 PharMeDoc Convertible Pregnancy Pillow is a full body pillow. The cover is filled with poly-filling that gives a comfortable loft to the pillow. This cover is then protected by a zippered cotton cover that is soft and machine-washable. It has a double-stitching that lasts a long time. The pillow does not have lead, latex, phthalates or BPA. This pillow has a detachable extension that converts the U-shaped pillow to a C-shaped pillow. PharMeDoc Convertible Pregnancy Pillow is a U-shaped pillow that can be converted into a C-shaped pillow. Simply detach the extension on your left side. This detachable section can be used to the right or left. It lends two benefits – You can lay your arms flat by your side or remove it completely. When you leave it attached you place your head in the curve of the pillow, the two arms support your body. You can even surround yourself at the bottom. When you detach the left-hand side arm it converts to a C-shaped pillow. The detached section can be used to add an upper body or lower body elevation. This pillow is suitable for pregnant women or just about anyone who wants or needs support from all around. The contoured pillow supports the head, neck, belly, back, legs, etc. In short, it’s like lying in an oval doughnut. PharMeDoc Convertible Pregnancy Pillow measures 53 inches in length, 31 inches in width and 7 inches in the loft. It weighs 8 pounds. PharMeDoc Convertible Pregnancy Pillow comes with a lifetime warranty. Moonlight Slumber guarantees that their pillow will never lump or clump. They are meant to comfort you and help you stretch out while lending support. You can reposition these pillows the way you like to watch TV, read in bed, alleviate your aches and pains. Moonlight Slumber Comfort-U pillows are made of synthetic down called Fusion Fibre. It is lightweight, washable and portable. The filling is stuffed in a removable washable cover that is 50-50 polycotton. The filling and the cover are washable. The U-shaped pillow is flexible. Thus, it can be used to wedge your body with the head in the curve of the U, while the two legs support you from front and back. It can be twisted in used in various ways to lounge around. Moonlight Slumber Comfort-U pillow is ideal for athletes, seniors and expectant mothers. The pillow can be used to soothe away aches and pains. It can be used for upper and lower body elevation. If you are recovering from surgery or nursing simply fold the pillow into a convenient position. This microfibre pillow helps you sleep through the night as the loft allows for ventilation. And the arms support your body laterally. Sleeping on the side helps better circulation and temperature regulation. The pillow supports your baby-belly and knees in the front and your spine and hips in the back. The decompression lets you slumber in peace. This pillow is hypoallergenic, odourless and does not collect dust and mites. It is completely machine washable. Put the pillow in the standard cycle then run the dryer. It will not clump or lump. Simply fluff the stuffing and reuse. Moonlight Slumber Comfort-U pillow is 60 inches long, 35 inches wide with a 7-inch loft. The pillow is 9.9 pound in weight. Moonlight Slumber Comfort-U pillow comes with a cover and a lifetime warranty. This pillow lends total body support with the latest design for use during pregnancy. These pillows are developed by a practising physical therapist. The pillow offers you customized support through your pregnancy. And serves you after delivery as a maternity pillow. The AngQi 55-inch Pregnancy Pillow is a versatile U-shaped pillow that moulds to your body. You can fold and twist the pillow in various positions and styles to add chic comfort to your life. The pillow conforms to the curves of your body for various uses and conveniences. The pillow is covered with a soft jersey cover that has a zipper. It is removable and washable. The inner lining is 100 per cent polyester. It is breathable and durable. The polyester lining is filled with polyester hollow fibres that make this pillow soft and light. The AngQi 55-inch Pregnancy Pillow is premium grade pillow that allows expectant mothers a restful sleep. It alleviates the discomforts associated with pregnancy. And it serves as a maternity tool post-partum too. You can place your baby or babies in a convenient position and feed it. While sleeping the pillow supports your head in the curve and the two limbs support the front and back of your body. It offers relief from fibromyalgia, sciatica, GERD, etc. You could use it while recovering from an operation or while reading, nursing or watching TV. The stretchable outer cover is soft and machine-washable. The material and construction of the pillow ensure that the pillow will last you a lifetime. The AngQi 55-inch Pregnancy Pillow is 55 inches long, 31 inches wide and 7 inches high. The unit weighs 6.25 pounds. The AngQi 55-inch Pregnancy Pillow comes with a pillow cover and a lifetime warranty. The pillow arrives compressed for easy delivery. Let it breathe and decompress for a day after you have unpacked it. Zen Bamboo is a brand by Hangzhou ZEN Bamboo Co. They specialize in the research and development of production and sales of bamboo products. China is the birthplace of bamboo culture. It is used in household items, handicrafts, food and fibre. The company’s mission is to achieve technical excellence and sustainable development of innovative trend-setting solutions using bamboo in every aspect of life. Zen Bamboo Pregnancy Pillow designed to cushion the contours of your body. It supports your back, head, legs, belly, etc. The shape, size and contours of the pillow relieve sciatica, back pain, haemorrhoids, ME, etc. 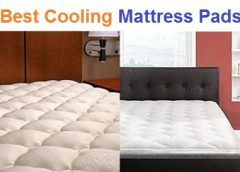 The cover is breathable thus it keeps you cool and prevents night sweats. The jacquard is mixed with rayon derived from bamboo fibre. The fabric not only feels good against the skin it is hypoallergenic. It is machine-washable thus easy to maintain. This is an eco-friendly product that is produced in a sustainable manner. Zen Bamboo Pregnancy Pillow replaces the many pillows crowding your bed. The pillow not only saves precious space but also supports your baby belly, back and spine. It allows you to retain the neutral position of the spine to relax. It also helps prevent sciatica, heartburn and lower backache. After your baby is born it can be used as a maternity pillow where you nurse your little one. Rest assured, this pillow will soon become the favourite every family member including your pets. To the seniors, this helps relieve arthritis, haemorrhoids, etc. The athletes in your family will find it useful for upper and lower body elevation. Your fur babies would find it as snug and comfortable as the rest of you. Zen Bamboo Pregnancy Pillow is 51 inches by 31 inches by 9 inches in length, breadth and loft, respectively. Zen Bamboo Pregnancy Pillow comes with a lifetime warranty. Leachco products are designed by a certified nurse who is also a mother. Thus, the products are tried and tested on self and the family. They are BPA, Lead, Latex and Phthalate free. The Leachco Back ‘N Belly pregnancy pillow is a C-shaped pillow. It can be taken both ways, i.e., the curve of the C can support your back or your belly depending upon how you take the pillow. You can straddle it or you can lie in it the way you use a pool ring. Usually, your head rests on top of the C and legs straddle the bottom. As you progress into your pregnancy you will notice that your belly and back – both need support at the same time. This pillow provides both and eliminates the need to adjust the pillows during the night. The firmness and the loft of the pillow ensure good air circulation around you so that you do not feel too hot. The contours of the pillow are such that they adapt to the natural shape of your body. The pillow comes with a sham-style cover that is removable and machine-washable. The Leachco Back ‘N Belly supports the front and the back at the same time. It helps relieve the stress on the spine by supporting the neutral positioning. You can turn sides without repositioning. The cushion offers full support to the body and elevates shoulders, back and neck. You can recline and cradle your lower body while watching TV or reading. This pillow is also useful for people with orthopaedic issues and others recuperating from surgery. The Leachco Back ‘N Belly is 52 inches long, 33.5 inches wide with a loft of 8.8 inches. The pillow weighs 7.04 pounds. The cover is 65% polyester and 35% cotton. The Leachco Back ‘N Belly comes with a cover and a lifetime warranty. Pillow Capital is a luxury bedding company focused on bringing you various products that are made of premium quality materials. These materials are made into ergonomic designs that serve as an all-purpose solution that you will reach for each time. Pillow Capital Pregnancy Pillow is made of luxurious polyfill fibre that is stuffed in a cotton cover. The loft of the pillow can be adjusted. The unit comes with a grey and white 100% cotton percale cover. The neutral colours blend well with your decor. The cover comes with a zipper thus it is removable and washable. The U-shaped pillow has a curve and two limbs that hug you, surrounding you in a snug haven. Pillow Capital U-Shaped Pillow is a multipurpose pillow that replaces five regular pillows on your bed. The pillow is filled with hypoallergenic poly fibre stuffed in a cotton cover. The unit comes with a removable cover that is machine washable. The loft of the pillow can be adjusted by adding or removing the fibre. The interlocked double stitching on the covers prevents fraying and open seams. The cotton covers are hypoallergenic and natural against the skin. The pillow lends firm support to the head, back, neck, belly, hips, and legs. It lends relief from conditions related to pregnancy, back pain, sciatica, fibromyalgia, GERD, etc. Your body temperature should be around 20 degrees centigrade for you to fall asleep. The loft and material allow air circulation and keep you cool through the night. The covers can be removed and washed to maintain the hygiene of your bedding. The bent of the U is for neck and shoulder support. The limb in the front offers belly support, the limb at the back is for back support and hip alignment. The lower end of the limb offers knee and ankle support and improved blood circulation. Pillow Capital U-Shaped Pillow comes is 55 inches in length, 35 inches wide with a 9-inch loft. Pillow Capital U-Shaped Pillow comes with a guide to pregnancy, health and fitness and a lifetime warranty. PharMeDoc makes health, wellness and fitness products. They make orthopaedic pillows such as posture cushions made of memory foam besides pregnancy and maternity pillows. They also make massage therapy tools. 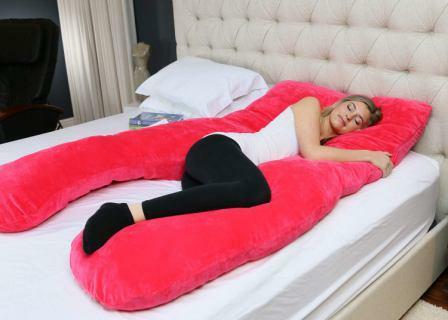 PharMeDoc Pregnancy Pillow is a C-shaped full body pillow. It replaces the numerous pillows on your bed. The pillow has two covers. The first zippered cover holds the filling. The loft of the pillow can be adjusted to your convenience. The outer cover is made of cotton thus hypoallergenic and machine-washable. PharMeDoc Full Body Pregnancy Pillow is C-shaped with the narrower upper end compared the lower. The pillow hugs you from all sides while lying, sitting or reclining. The pillow helps align your back and support the body while sleeping. You can sit upright or recline while nursing, working on the laptop or reading the newspaper. The curve on the pillow lends a hip and belly support. The cover material is soft yet dense. It is machine-washable and the durable double stitching tolerates the stress on the seams well. The pillow will last you a lifetime. You should start using pregnancy pillows around the 20th week or later. This is because the belly gets heavier and lying on the side becomes difficult. The limbs of the pregnancy pillow not only lend support it also hugs you for comfort. We all know hugs release endorphins leading to a feeling of wellbeing. A happy healthy mother brings forth a healthy baby. Besides using a pregnancy pillow not only prevents crowding your bed but also relieves acid reflux, heartburn and stress on the spine. Lying on the side enhances blood circulation which in turn means better nourishment and ventilation for your baby. PharMeDoc C-shaped Pregnancy Pillow is 57 inches in length, 30 inches in width and 7 inches in the loft. It weighs 7 pounds. PharMeDoc Full Body Pregnancy Pillow comes with a pillow cover and a lifetime warranty. NiDream Bedding makes fleece blankets, bedsheets, duvets and pillow covers, pregnancy pillows. These products are made of cotton, microfibre and other high-quality materials. This is to ensure better sleep due to superior materials that ensure optimal sleeping conditions. These materials are also easy to maintain the highest hygienic conditions. The NiDream Bedding U-shaped Pregnancy Pillow is filled with 7D PP cotton. The inner cover is brushed fabric and outer cover with the zipper is 100 per cent cotton. The new upgrade is 5 inches longer than the previous pillow making these one 60 inches long. The pillow arrives vacuum-sealed and compressed. Simply unpack and leave it in a well-ventilated place for the pillow to gain its full shape and size. The NiDream Bedding U-shaped Pregnancy Pillow helps align the spine and hips in the neutral position. It cradles the body from all sides supporting and cradling it. The pillow allows you to move from side to side while maintaining its shape. The obstetricians recommend sleeping laterally to increase the blood circulation and lung ventilation for the mother. This also benefits the child. Besides the pillow lends support to the belly in the front this reduces stretch marks. The extra-long pillow gives to support from 360°. The U-shape lends upper and lower body support as the pillow is customizable into any position. This is not only a pregnancy pillow but can be useful to everybody at home – be they the seniors, kids, pet or other adults like you. You can use this pillow for recovery from surgeries, for rheumatoid arthritis, for sleep apnoea, etc. It can be used by athletes for rest and training. It’s versatile and multipurpose. The pillow cover can be removed for washing. You can find replacement covers online. The NiDream Bedding U-shaped Pregnancy Pillow is 60 inches by 31 inches in length and breadth while its loft is 7.8 inches. The unit is 7.5 pounds. The NiDream Bedding U-shaped Pregnancy Pillow comes with a pillow cover and a lifetime warranty. Meiz is an online store that sells pregnancy pillows in various sizes and their covers. These pillows are made of premium velvet soft cotton and hypoallergenic stuffing. The pillows and their covers are meant to last and serve your entire family for years to come. Meiz Luxury Pregnancy Pillow us a U-shaped pillow that has two covers. The inner cover is stuffed with polyfill material. The inner cover is brushed fabric and the outer cover is cotton. The unit is 60 inches long that supports the weight of your entire body and sides. The outer cover has a zipper that can be removed and washed. Meiz Luxury Pregnancy Pillow is made of premium materials that will last you a long time. They will help you sleep better while your baby grows inside you. We all know the therapeutic effects of sleep and how it helps to detoxify and maintain the homeostasis in the body. It not only supports your body in the back and hips but also the front. The growing belly is well supported too. This multi-purpose pillow is useful in feeding your baby, playing with your toddler or pet. You can make it into a seat or use it for lower body elevation besides the usual upper body elevation. The other therapeutic effects are it relieves pressure due to injury or surgery. You can use it to stop snoring, GERD, calm hypertension etc. You can eliminate tossing and turning in sleep to find a comfortable position. It is useful for side, stomach and back sleepers too. It is easy to maintain hygiene as the covers come off to wash. You can maintain the fluffiness of the pillows by sunning them. Meiz Luxury Pregnancy Pillow is 60 inches long, 31inches wide and 7.8 inches thick. The pillow weighs 8.45 pounds. Meiz Luxury Pregnancy Pillow comes with a grey cover and a lifetime warranty. Restorology makes orthopaedic tools and products that help restore your body in sleep or recovery. They make leg rest pillows, pregnancy pillows, deep kneading shiatsu massagers, stack pillows and lumbar supports. They make air mattresses, weighted blankets, contour pillows, etc. Restorology Full 60-Inch Body Pregnancy Pillow is meant for expectant mothers and postpartum care. The pillow adjusts naturally to the curves of the body especially the back and belly. The C-shaped pillow can offer support to the back and the belly anyway it is taken. The curve of the C can support the back or the belly depending upon how you hug it. While the top of the C supports the head and neck and the base is straddled between the legs. The base of the C supports the hips and back easing the pressure points. This is a multifunctional pillow that relieves and prevents the symptoms of pregnancy. Restorology Full 60-Inch Body Pregnancy Pillow is an ergonomically designed to follow the curves of the body. It supports your back, head, belly etc. It helps maintain the neutral position and relieve heartburn, sciatica and backache. The pillow comes with a cover that is easy to remove, machine wash and tumble dry. This pillow lends you the support you need and cuts out fiddling with multiple pillows. It serves as side support that equally aligns the neck, hips, spine and legs while you sleep on your side. It is easy to maintain the loft of the pillow if you sun it every week as it expands the air trapped between the fibres. Sunning and airing the pillows also kills germs due to the UV irradiation. The cover is removable and machine-washable. Restorology Pregnancy Pillow is 60 inches long, 35 inches wide with a loft of 8.4 inches. The pillow weighs 6.85 pounds. Restorology Full 60-Inch Body Pregnancy Pillow comes with a cover and a lifetime warranty. Meiz brings you another pillow for body support and snug comfort. This pillow is a perfect gift for the mother-to-be and the rest of the family. These pillows not only help with pregnancy but serve maternity purposes too such as feeding your baby, tummy support for comfort. You can do mild exercises using it as a weight. 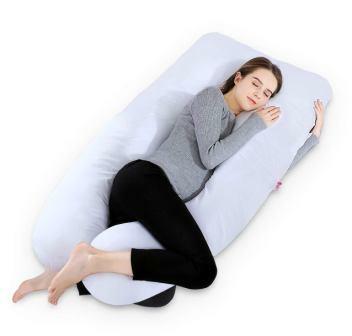 Meiz U Shaped Pregnancy Body Pillow cocoons you in its warmth and support. The pillow is filled with polyethene 7D hollow fibre. The air spaces between the fibers expand when exposed the warmth of the sun and the pillow regains its loft. The fiber is stuffed in a brushed fiber bag that is then covered with a 100% velvet cover. There is a double zipper on the cover that helps easy removal and washing. Meiz U Shaped Pillow is meant to support the growing belly of a mother. It can also be used to breastfeed, watch TV or support the spine while sitting and lying down. Besides this pillow will be found useful by people recovering from injury, tired or needing more support for hip, knees, etc. The pillow aligns the spine in a neutral position. There are various sleeping positions suggested for people suffering from neck pain, backaches, knee and hip aches etc. This pillow is ideal for such patients and lends them support so that they can sleep well and rise without stiffness and pain. It is ideal for back, side and stomach sleepers as the loft is adjustable. You can use it in a U shape, coil it into a Q or O. You can even fold it under yourself to relieve the haemorrhoids. 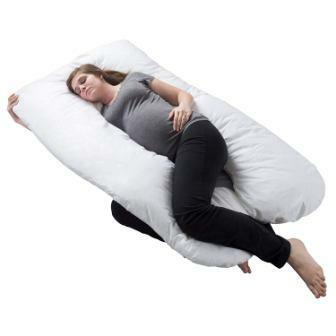 Meiz U-Shaped Pregnancy Pillow is 55 inches in length, 30.7 inches in width and 6.3 inches in the loft. It weighs 7 pounds. Meiz U Shaped Pregnancy Pillow comes with a cover and a lifetime warranty. Bluestone is a home decor and utility brand. They sell beddings such as waterproof mattresses, down alternatives, pillow cases, reversibles, etc. Bathroom accessories such as shavers, callus removers, nail care, shower and bath accessories, etc. Orthopaedic products like back support, compression sleeves, therapy wraps, joint support, etc. Bluestone Pregnancy Pillow is filled with poly fibre. The oversized inner jacket is stuffed with the fibre and covered with an outer cover for hygiene. The contoured pillow conforms to the shape of your body and aligns to your hips. Bluestone Pregnancy Pillow has an inner jacket filled with polypropylene fibre. The outer cover is cotton thus hypoallergenic. The U-shaped pillow is ergonomically designed to fit the curves of your body. It supports your back, aligns your hips and helps you maintain the neutral position of the body. The pillow relieves pain and discomfort associated with sciatica, fibromyalgia, gastric reflux, ankle and back pain, etc. The pillow replaces multiple pillows that may crowd your bed. This all – in – one pillow supports all the parts of your body for better sleep. You can use it in various ways while watching TV, reading, or nursing. The product can be used by adults, infants, children and pets. This is because the outer cover is hypoallergenic and 100% cotton. The cover has a zipper thus removable and machine washable. The filling is made of hollow fibres that have air pockets. The air expands when exposed to the warmth of the sun. Thus to maintain the loft and fluff of your pillow air and sun it weekly. The product arrives vacuum-packed. So as to use the pillow unpack and let it air for 24 hours. Fluff and pat the pillow for it to gain its full shape. The Bluestone Pregnancy Pillow is 60 inches long, 38 inches wide and 7 inches thick. The unit is 7.25 pounds in weight. Bluestone Pregnancy Pillow comes with a pillowcase and a lifetime warranty. Huggaroo is a Nashville, TN based company founded by Dr Wendy Jordanov. She is a PhD in Educational Psychology and an expert in Developmental Psychology. Her company sells hot and cold wraps, weighted blankets and lap pads. They sell body pillows, pregnancy pillows and pouches too. Huggaroo Support-U Pillow is an extra-large pillow with a proprietary filling that retains the fullness and loft for years. The pillow is stuffed with Huggaroo proprietary Cloud Comfort filling. It is bouncy, elastic and well-ventilated thus allows the pillow to maintain its shape. The pillow features a luxurious plush mink cover in pink. It is removable and washable. The dimensions are large enough to cocoon all of you in its hugging warmth. Huggaroo Support-U Pillow is an extra-large pillow that lets you sleep on your side for maximum blood circulation and pulmonary ventilation. The pillow is comfortable as it supports your neck, back, hips and legs. It is great to sleep on your side or back. It lends support while reading, watching TV, relaxing or nursing. The unique ergonomic design using premium materials has been executed with expert craftsmanship. The plush cover is removable and washable. It can be replaced in two colours dark grey and sizzle pink. The pillow comes vacuum-packed. This let it air and allow it a week to gain its original shape. It would help to sun the pillow as the air trapped in the spaces expands letting the pillow gain its full loft. You can also use a hair dryer to fluff your pillow as the hot air will help blow-up the air pockets. Huggaroo Support-U Pillow is extra-large. This means it is longer than most U-pillows with a length of 72 inches, the width of 38 inches and a thickness of 6 inches. The pillow weighs 10 pounds. Huggaroo Support-U Pillow comes with a cover and a lifetime warranty. Marine Moon is an online store that sells flannel blankets, crib mattresses, shower chairs, mattress toppers, latte mugs, throw pillows, channel scanners, beauty masks, etc. You name it – this utility store has it. Marine Moon Pregnancy Pillow is a jumbo-sized pillow that comes with extra filling. This U-Shaped pillow is flexible. It hugs your neck and shoulders. One of the limbs will hug the front of your body and support the belly. While the back will support the hips and back. The lower extremities of the pillow will elevate the lower body to relieve swelling in legs, ankles and feet. The inner cotton jacket is filled with 7D fibre and the outer cover is made of cotton. The unit comes with an additional 1.1 pounds of filling to help adjust the loft of the pillow. 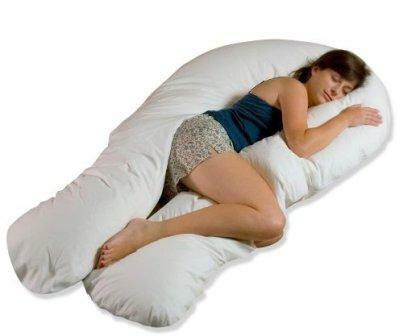 Marine Moon Pregnancy Pillow is a 69-inch-long U-pillow that hugs you from all sides. You can arrange it in a circle, a cross, a coil for your lounging and lying comfort. It is ideal for a queen- or king-sized bed but can be arranged on the couch, sofa, etc., too. The extra filling comes as a gift to the expectant mother so that she can adjust the loft of the pillow according to her comfort. The pillow supports the body from head to toe and eliminates the need for standard pillows. It alleviates the conditions associated with pregnancy as it supports the hips, back, head, neck, shoulders, back and belly. The filling can be fluffed as the fibres are hollow and air-filled. The pillow regains its shape easily. The pillows arrive vacuum packed you can expose it to the warm sun and fluff it. 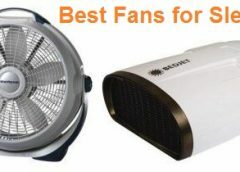 Another quick fix is to use a hair dryer to blow warm air so that the pillow expands quickly. The Marine Moon Pregnancy Pillow is 69 inches long, 31 inches wide and 6.5 inches thick. The pillow weighs 8.5 pounds. Marine Moon Pregnancy Pillow comes with a lifetime warranty. Boppy – the Original is the beloved nursing pillow invented by a Mother in 1989. Each one of Boppy products is created with pride, passion and precision. Their products include prenatal and post-natal support and travel accessories that encourage happy parents and babies. Boppy Total Body Pillow ensures a great night’s sleep for the mother and the baby in the belly. 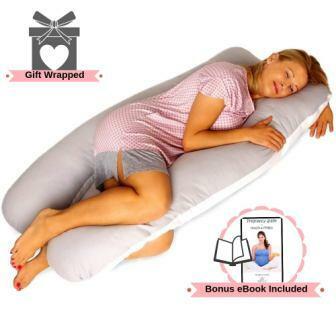 This is a one-piece pregnancy pillow that can be used in many ways. Mostly it supports the growing baby bump taking the weight off the spine and hips. The contoured design supports your body from head to toe. The pillow is stuffed with 100% fresh virgin fibre and the jacket is 100% cotton. The unit comes with a pillow cover with a zipper. Boppy Multi-use Slipcovered Total Body Pillow has been recommended by doctors as its contours and length are efficient in alleviating the physical issues that arise during pregnancy. The pillow lends support while sleeping, sitting and lounging. While you are sleeping the pillow can be fully expanded it forms a C that hugs the front and supports the belly. Another positive is that the depression in the middle lets you pass your arm to the other side or lets it rest on it. While you are sitting it folds up to become a plush backrest. You can even twist the pillow half and a half – where one half supports the back while the other half forms a table to nurse or form an armrest. The pillow is multipurpose pillow can be used by seniors, athletes and pets too. Boppy Total Body Pillow is 48 inches by 25 inches in length and breadth while its thickness is 8 inches. The pillow weighs only 5 pounds. The Boppy Total Body Pillow comes with a pillow cover and a lifetime warranty.